1 A None No Power Seat 1 A is a standard Business Class recliner style seat located at a bulkhead that has restricted legroom. The proximity to the galley and lavatory area might be bothersome. 1 B None No Power Seat 1 B is a standard Business Class recliner style seat located at a bulkhead that has restricted legroom. The proximity to the galley and lavatory area might be bothersome. 1 E None No Power Seat 1 E is a standard Business Class recliner style seat located at a bulkhead that has restricted legroom. The proximity to the galley and lavatory area might be bothersome. 1 F None No Power Seat 1 F is a standard Business Class recliner style seat located at a bulkhead that has restricted legroom. The proximity to the galley and lavatory area might be bothersome. 10 A None No Power Seat 10 A is a standard Economy Class seat. Aeromexico classifies this seat as a "Preferred Seat." Selection of this seat is available for an additional fee. 10 C None No Power Seat 10 C is a standard Economy Class seat. Aeromexico classifies this seat as a "Preferred Seat." Selection of this seat is available for an additional fee. 10 D None No Power Seat 10 D is a standard Economy Class seat. Aeromexico classifies this seat as a "Preferred Seat." Selection of this seat is available for an additional fee. 10 F None No Power Seat 10 F is a standard Economy Class seat. Aeromexico classifies this seat as a "Preferred Seat." Selection of this seat is available for an additional fee. 11 F None No Power Seat 11 F is a standard Economy Class seat that may have limited recline due to the Exit Row behind. 12 B None No Power Seat 12 B is a standard Economy Class seat located in an Exit Row that has an inch of extra legroom. However, this seat may not recline due to its positioning in the Exit Row. Passengers traveling with a partner prefer the seats in this row since the absence of a third seat gives you more privacy. 12 C None No Power Seat 12 C is a standard Economy Class seat located in an Exit Row that has an inch of extra legroom. However, this seat may not recline due to its positioning in the Exit Row. Passengers traveling with a partner prefer the seats in this row since the absence of a third seat gives you more privacy. 12 D None No Power Seat 12 D is a standard Economy Class seat located in an Exit Row that has an inch of extra legroom. However, this seat may not recline due to its positioning in the Exit Row. Passengers traveling with a partner prefer the seats in this row since the absence of a third seat gives you more privacy. 12 E None No Power Seat 12 E is a standard Economy Class seat located in an Exit Row that has an inch of extra legroom. However, this seat may not recline due to its positioning in the Exit Row. Passengers traveling with a partner prefer the seats in this row since the absence of a third seat gives you more privacy. 14 A None No Power Seat 14 A is a standard Economy Class seat located in an Exit Row that has a lot of extra legroom due to the absence of the seat in front. Aeromexico classifies this seat as a "Preferred Seat." Selection of this seat is available for an additional fee. The tray table is installed in the armrest making the armrest immovable and slightly reducing seat width. Floor storage is not available during takeoff and landing. It may get chilly in this seat due to the proximity to the exit door. 14 B None No Power Seat 14 B is a standard Economy Class seat located in an Exit Row that has additional legroom. Aeromexico classifies this seat as a "Preferred Seat." Selection of this seat is available for an additional fee. The tray table is installed in the armrest making the armrest immovable and slightly reducing seat width. Floor storage is not available during takeoff and landing. 14 C None No Power Seat 14 C is a standard Economy Class seat located in an Exit Row that has additional legroom. Aeromexico classifies this seat as a "Preferred Seat." Selection of this seat is available for an additional fee. The tray table is installed in the armrest making the armrest immovable and slightly reducing seat width. Floor storage is not available during takeoff and landing. 14 D None No Power Seat 14 D is a standard Economy Class seat located in an Exit Row that has additional legroom. Aeromexico classifies this seat as a "Preferred Seat." Selection of this seat is available for an additional fee. The tray table is installed in the armrest making the armrest immovable and slightly reducing seat width. Floor storage is not available during takeoff and landing. 14 E None No Power Seat 14 E is a standard Economy Class seat located in an Exit Row that has additional legroom. Aeromexico classifies this seat as a "Preferred Seat." Selection of this seat is available for an additional fee. The tray table is installed in the armrest making the armrest immovable and slightly reducing seat width. Floor storage is not available during takeoff and landing. 14 F None No Power Seat 14 F is a standard Economy Class seat located in an Exit Row that has a lot of extra legroom due to the absence of the seat in front. Aeromexico classifies this seat as a "Preferred Seat." Selection of this seat is available for an additional fee. The tray table is installed in the armrest making the armrest immovable and slightly reducing seat width. Floor storage is not available during takeoff and landing. It may get chilly in this seat due to the proximity to the exit door. 2 A None No Power Seat 2 A is a standard Business Class recliner style seat. 2 B None No Power Seat 2 B is a standard Business Class recliner style seat. 2 E None No Power Seat 2 E is a standard Business Class recliner style seat. 2 F None No Power Seat 2 F is a standard Business Class recliner style seat. 25 A None No Power Seat 25 A is a standard Economy Class seat that is in the last row of the aircraft. This seat may have limited recline due to the bulkhead behind. The proximity to the galley and lavatory area might be bothersome. 25 B None No Power Seat 25 B is a standard Economy Class seat that is in the last row of the aircraft. This seat may have limited recline due to the bulkhead behind. The proximity to the galley and lavatory area might be bothersome. 25 C None No Power Seat 25 C is a standard Economy Class seat that is in the last row of the aircraft. This seat may have limited recline due to the bulkhead behind. The proximity to the galley and lavatory area might be bothersome. 25 D None No Power Seat 25 D is a standard Economy Class seat that is in the last row of the aircraft. This seat may have limited recline due to the bulkhead behind. The proximity to the galley and lavatory area might be bothersome. 25 E None No Power Seat 25 E is a standard Economy Class seat that is in the last row of the aircraft. This seat may have limited recline due to the bulkhead behind. The proximity to the galley and lavatory area might be bothersome. 25 F None No Power Seat 25 F is a standard Economy Class seat that is in the last row of the aircraft. This seat may have limited recline due to the bulkhead behind. The proximity to the galley and lavatory area might be bothersome. 3 B None No Power Seat 3 B is a standard Business Class recliner style seat. 3 E None No Power Seat 3 E is a standard Business Class recliner style seat. 3 F None No Power Seat 3 F is a standard Business Class recliner style seat. 6 A None No Power Seat 6 A is a standard AM Plus Economy Class seat located at a bulkhead. Aeromexico classifies this seat as "AM Plus" which provides an additional 4 inches of legroom for an additional fee. The tray table is installed in the armrest making the armrest immovable and slightly reducing seat width. Floor storage is not available for this seat during takeoff and landing. 6 B None No Power Seat 6 B is a standard AM Plus Economy Class seat located at a bulkhead. Aeromexico classifies this seat as "AM Plus" which provides an additional 4 inches of legroom for an additional fee. The tray table is installed in the armrest making the armrest immovable and slightly reducing seat width. Floor storage is not available for this seat during takeoff and landing. 6 C None No Power Seat 6 C is a standard AM Plus Economy Class seat located at a bulkhead. Aeromexico classifies this seat as "AM Plus" which provides an additional 4 inches of legroom for an additional fee. The tray table is installed in the armrest making the armrest immovable and slightly reducing seat width. Floor storage is not available for this seat during takeoff and landing. 6 D None No Power Seat 6 D is a standard AM Plus Economy Class seat located at a bulkhead. Aeromexico classifies this seat as "AM Plus" which provides an additional 4 inches of legroom for an additional fee. The tray table is installed in the armrest making the armrest immovable and slightly reducing seat width. Floor storage is not available for this seat during takeoff and landing. 6 E None No Power Seat 6 E is a standard AM Plus Economy Class seat located at a bulkhead. Aeromexico classifies this seat as "AM Plus" which provides an additional 4 inches of legroom for an additional fee. The tray table is installed in the armrest making the armrest immovable and slightly reducing seat width. Floor storage is not available for this seat during takeoff and landing. 6 F None No Power Seat 6 F is a standard AM Plus Economy Class seat located at a bulkhead. Aeromexico classifies this seat as "AM Plus" which provides an additional 4 inches of legroom for an additional fee. The tray table is installed in the armrest making the armrest immovable and slightly reducing seat width. Floor storage is not available for this seat during takeoff and landing. 7 A None No Power Seat 7 A is a standard AM Plus Economy Class seat. Aeromexico classifies this seat as "AM Plus" which provides an additional 4 inches of legroom for an additional fee. 7 B None No Power Seat 7 B is a standard AM Plus Economy Class seat. Aeromexico classifies this seat as "AM Plus" which provides an additional 4 inches of legroom for an additional fee. 7 C None No Power Seat 7 C is a standard AM Plus Economy Class seat. Aeromexico classifies this seat as "AM Plus" which provides an additional 4 inches of legroom for an additional fee. 7 D None No Power Seat 7 D is a standard AM Plus Economy Class seat. Aeromexico classifies this seat as "AM Plus" which provides an additional 4 inches of legroom for an additional fee. 7 E None No Power Seat 7 E is a standard AM Plus Economy Class seat. Aeromexico classifies this seat as "AM Plus" which provides an additional 4 inches of legroom for an additional fee. 7 F None No Power Seat 7 F is a standard AM Plus Economy Class seat. Aeromexico classifies this seat as "AM Plus" which provides an additional 4 inches of legroom for an additional fee. 8 A None No Power Seat 8 A is a standard AM Plus Economy Class seat. 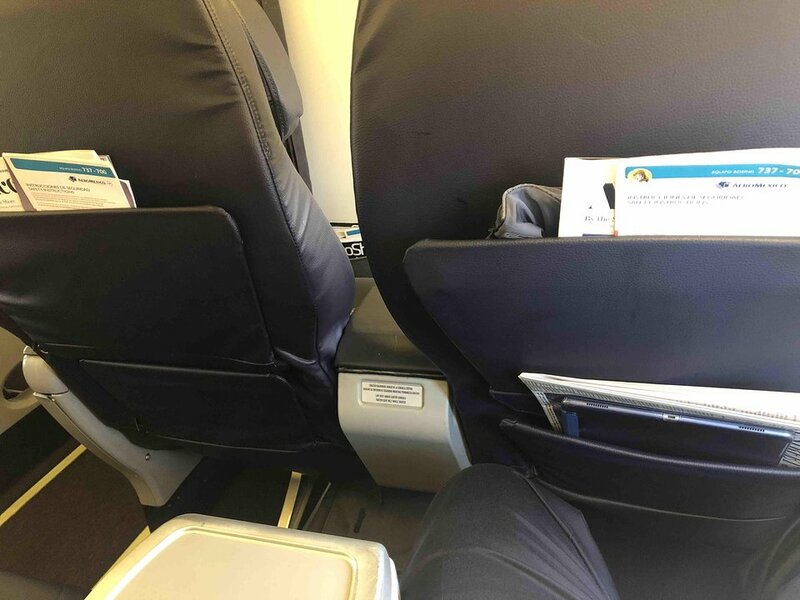 Aeromexico classifies this seat as "AM Plus" which provides an additional 4 inches of legroom for an additional fee. 8 B None No Power Seat 8 B is a standard AM Plus Economy Class seat. Aeromexico classifies this seat as "AM Plus" which provides an additional 4 inches of legroom for an additional fee. 8 C None No Power Seat 8 C is a standard AM Plus Economy Class seat. Aeromexico classifies this seat as "AM Plus" which provides an additional 4 inches of legroom for an additional fee. 8 D None No Power Seat 8 D is a standard AM Plus Economy Class seat. Aeromexico classifies this seat as "AM Plus" which provides an additional 4 inches of legroom for an additional fee. 8 E None No Power Seat 8 E is a standard AM Plus Economy Class seat. Aeromexico classifies this seat as "AM Plus" which provides an additional 4 inches of legroom for an additional fee. 8 F None No Power Seat 8 F is a standard AM Plus Economy Class seat. Aeromexico classifies this seat as "AM Plus" which provides an additional 4 inches of legroom for an additional fee. 9 A None No Power Seat 9 A is an Economy Class seat that is missing a window. Aeromexico classifies this seat as a "Preferred Seat." Selection of this seat is available for an additional fee. 9 D None No Power Seat 9 D is a standard Economy Class seat. Aeromexico classifies this seat as a "Preferred Seat." Selection of this seat is available for an additional fee. 9 E None No Power Seat 9 E is a standard Economy Class seat. Aeromexico classifies this seat as a "Preferred Seat." Selection of this seat is available for an additional fee. 9 F None No Power Seat 9 F is an Economy Class seat that is missing a window. Aeromexico classifies this seat as a "Preferred Seat." Selection of this seat is available for an additional fee. On select flights, Clase Premier Business Class passengers can choose from a selection of movies on a personal Sony Video Walkman. On other fights, Clase Premier has overhead TVs. In Main Cabin Economy Class, movies are shown on overhead screens throughout the cabin. Aeromexico operates the Boeing 737-700 on short to medium-haul fligths. This aircraft features three classes: Clase Premier, AM Plus, and Main Cabin Economy. This aircraft flies with 12 Clase Premier seats, 18 AM Plus seats and 94 Economy Class seats. The AM Plus seats offer passengers an additional 3" of legroom and an extra 1.5" recline compared to the standard Main Cabin Economy Class seats. Older cabin. No flatscreen tvs. No power. Its ok but not great. BAD SEAT, Premier class terrible, seats are old like 10 year old, no screen. Some economy seats are a lot better than this "premiun"
The First Class seats on this flight (SJD-MEX) were the worst I have ever had. We paid extra to fly Premier Clase and the seat bottoms had absolutely no padding left at all. We had to sit on our blankets. The seats only reclines 4 or 5 inches. They probably hadn't changed the seats in over 10 years. The pillows were used and had hair on them. They had no headphones available so we couldn't take advantage of in flight entertainment. The service was practically non existent. My soda was flat, they gave us nothing more than a muffin to eat and we had to ask for napkins. It was worse than any flight in coack that I have taken. 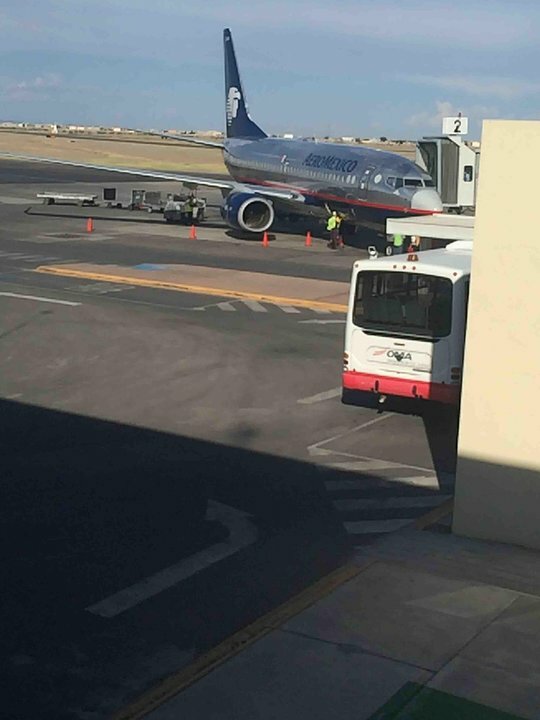 I will never, ever fly Aeromexico again. The plane was old, really old. The seats barely reclined for a relatively short red eye flight (paid lots extra for business class), and the console was cracked where the audio input jack was and misaligned. Aeromexico charge an extra price for this seat. This was a Scam. 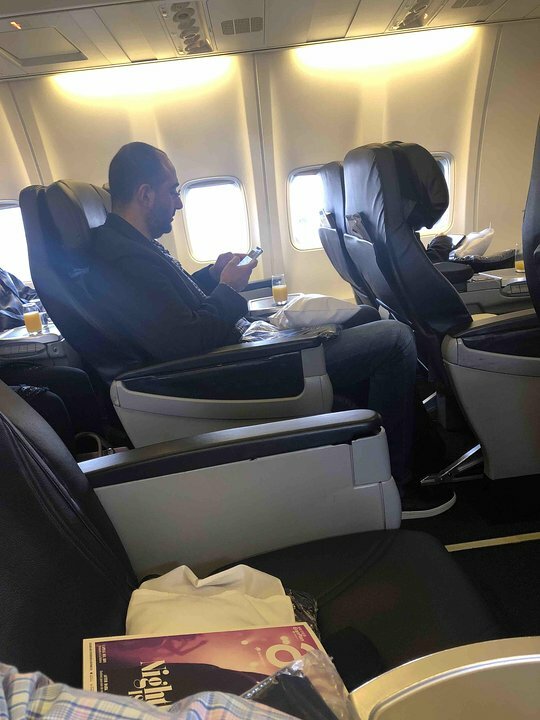 The seat had no extra leg space, only the same regular space for any other economy seat available. I paid 40 USD for nothing. 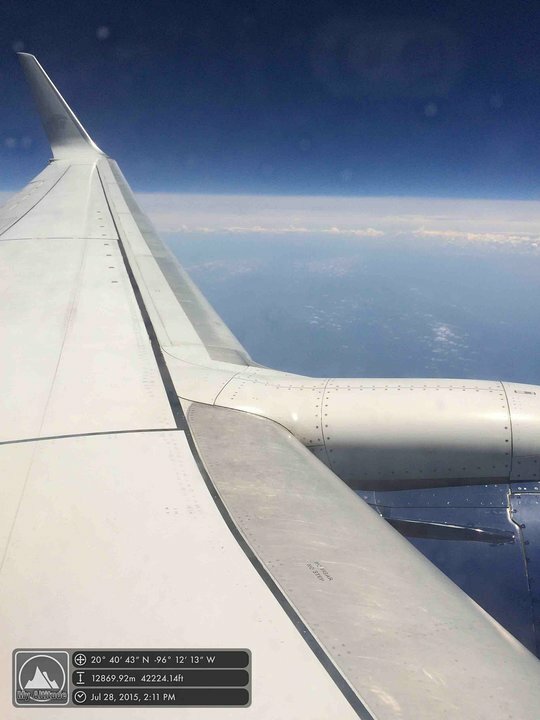 I took pictures and complained to Aeromexico, nobody cares. The girl at the counter and even flight attendands accepted this seats were just plain regular seats. Dont be fool, do not flight aeromexico, but if you have to dont trust paying extra for this seat. PD. My wife was also travelling with me, in seat 14E paying another 40 USD for this. Another scam. Seat in the row in front reclines so far you cannot get out of this seat without making the person in front of you sit up. I had to sit on the center console and hop across the aisle seat to get out to use the restroom. The video equipment is located in the overhead seats for this row so you are not able to store anything there you have to put it in the seat below. Aeromexico now charges for this seats as well for those on seats on Tourist Plus. Charges range from around 20 USD to 100 USD. This include Premier Class check-in and priority baggage handling, priotity boarding. Not really worth it, many times they won't respect it and Aeromexico's customer service won't care when you complain. 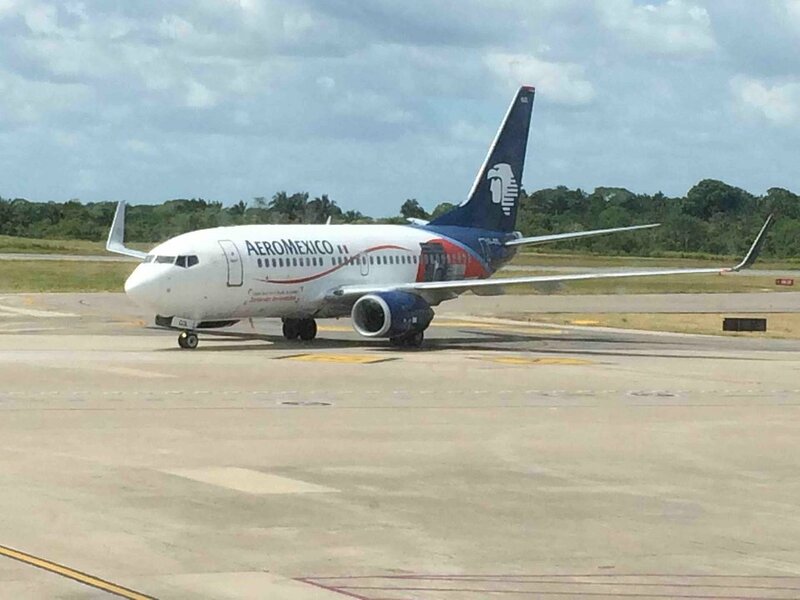 Aeromexico flies 1 versions of Boeing 737-700.